Electrosurgical Vessel Sealing Unit give consistent and repeatable output as required by the surgeon in different types of surgeries. Pure Cut gives the surgeon powerful and smooth cutting action. Coagulation is suitable for contact and non-contact operation. Bipolar output is suitable for gentle bipolar effect in all types of surgeries. Separate Monopolar and Bipolar R.F. output system allow two surgeons to work separately. Absolutely Safe as Isolated RF Output provides direct current return to the generator significantly reducing the risk of alternate site burns. Power-Limiting Output with Automatic Compensation Circuit provides more consistent performance over wide range of tissue impedance. Switching power supply accepts the wide range of input voltage from 150 to 270 Volts and hence keep the output constant throughout the range. Double Pedal Foot Switch (Monopolar) - 1 no. S.S. Patient plate with cable o - 1 no. Hand pencil disposable - 1 no. Autoclavable chuck handle - 1 no. Set of Electrode - 1 set. We have been requisite in this realm as the best manufacturer, exporter, and supplier of Nova Seal Vessel Sealer. This machine is used in packaging industry and is known for its robust design. The provided machine is manufactured at our well-developed production unit using optimum quality components and sophisticated techniques under the visionary guidance of our highly skilled experts. In addition, this Nova Seal Vessel Sealer can be purchased from us in several technical specifications as per the precise needs of clients at the most reasonable prices. Electrosurgical Unit gives consistent and repeatable output as required by the surgeon in different types of surgeries. Electrosurgical Unit give a best price-performance ratio in the similar class of generators offered by other manufacturers and can be widely used in general procedures. Absolutely Safe as Isolated RF Output provides the direct current return to the generator significantly reducing the risk of alternate site burns. 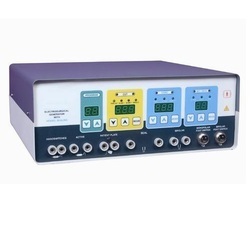 Electrocautery Nova 400 DP is Programmable generators give consistent and repeatable output as required by the surgeon in different types of surgeries. 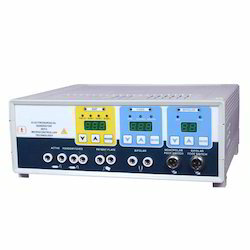 Electrocautery Nova 400 DP is electrosurgery generators gives the best price-performance ratio in the similar class of generators offered by other manufacturers and can be widely used in procedures including Urology, GI, Gynecologic, Orthopedic, Thoracic and Plastic Surgery. cut mode. Endo cut mode is provided for added flexibility. True Spray Coag mode offers massive and rapid non-contact coagulation. Fulgurate Coag mode for sealing bleeders. Desiccate Coag mode for contact coagulation. Micro / Macro Bipolar Modes provides controlled desiccation without charring, adhesion and blanching of tissues with bipolar cut and coag facility. Bipolar cut mode allows bipolar cutting operations. Patient plate monitoring system for high operational safety. Ten Programmable Modes provides memory features for repeatable surgery parameters without the need for adjustments during each surgery. Micro Controller tissue response circuit network measures output impedance every 40 nanoseconds and automatically adjusts the power. Volts and hence keep the output constant throughout the range. Single Pedal Foot Switch (Bipolar) - 1 no. We have been requisite in this realm as the best manufacturer, exporter, and supplier of Vessel Sealing Machine. This machine is used in packaging industry and is known for its robust design. The provided machine is manufactured at our well-developed production unit using optimum quality components and sophisticated techniques under the visionary guidance of our highly skilled experts. In addition, this Vessel Sealing Machine can be purchased from us in several technical specifications as per the precise needs of clients at the most reasonable prices. 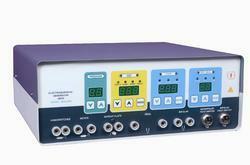 Dimension 4.5" x 10" X 12"
Electrocautery Nova 300 DP generators give consistent and repeatable output as required by the surgeon in different types of surgeries. E-300 electro surgery generators gives best price-performance ratio in similar class of generators offered by other manufacturers and can be widely used in procedures including Urology, GI, Gynecologic, Orthopedic, Thoracic and Plastic Surgery. Pure Cut Two Blend Modes gives the surgeon varying degree of Homeostasis in the cut mode. True Spray Coag mode offers massive and rapid non contact coagulation. Force Coag for low voltage contact coagulation. Soft Coag mode delivers better coagulation with less depth of Tissue Necrosis. Bipolar Mode provides controlled desiccation without charring, adhesion and blanching of tissues with bipolar cut and coag facility. POLYP CUT divides cutting into interval of cuts and pauses, e.g. in Polypectomy or papillotomy. Coagulation occurs during each pause giving a supremely controlled cut with coagulation effects. Six Programmable Modes for Plastic mode provides memory features for repeatable surgery parameters without the need for adjustments during each surgeries. Patient plate monitoring circuit helps to prevent patient plate burns. Micro Controller tissue response circuit network measures output impedance every 40 nano seconds and automatically adjusts the power. Double Pedal Foot Switch Monopolar - 1 no. Single Pedal Foot Switch Bipolar - 1 no.